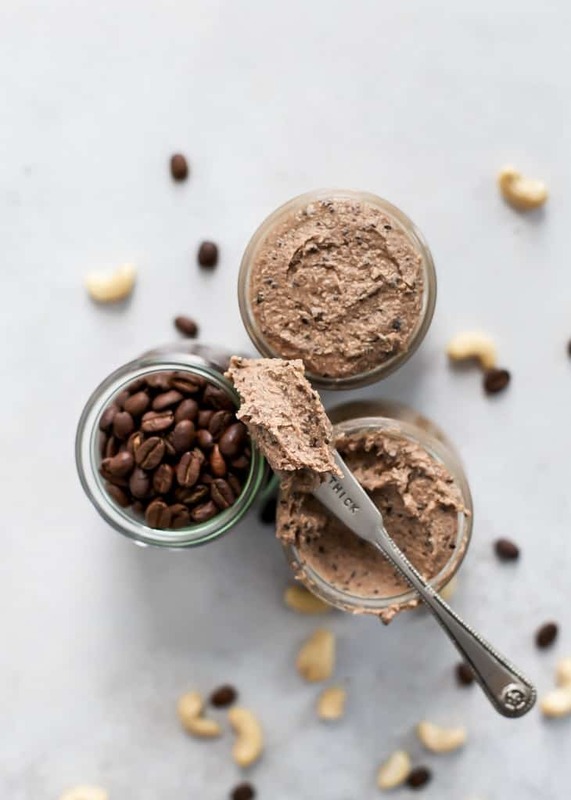 Calling all espresso lovers and nut butter addicts! You’re in for a special treat with this batch of homemade cashew butter. Did you know that early on in my blogging days I seriously considered starting my own nut butter line? I have this long list of nut butter flavors that I made where I wanted to share my crazy concoctions with the world. I suppose I am still doing that; I’m just sharing my ideas via the interwebs hoping you’ll jump on the nut butter train with me. What I love about making nut butter at home is you get to decide what goes into the ingredients. For a while I was dealing with an almond and coconut sensitivity (almost better now!) so any store-bought nut butters that were a blend of nuts or used oils I didn’t do well with, were off limits. Which is SO frustrating. But when you’re at home, you get to decide what goes into the batch and it’s pretty awesome! AND typically we’re saving some dolla dolla bills when making it at home. But I also love all the nut butters and various brands out there. My cupboard is still filled with tons of flavors and different brands – I am most definitely a nut butter addict. Sometimes I am also just lazy and want to pick up a jar off the shelves. 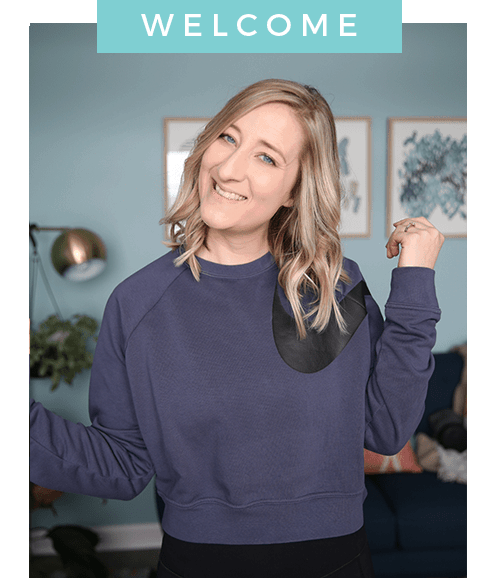 But back in the day when my nut butter obsession started, my cupboard literally overflowed with jars and I thought it might be best to save some money and start making my own at home. Thankfully at this time Mr. FMK and I had a wedding registry and one of the gifts we put on there was this food processor. <–Seriously it is a BOSS and highly recommend if you’re looking for one. It was high on the list and my sole purpose was to make all of the nut butters I could think of. Thankfully one of our dear friends knew how much I wanted that food processor and now here we are! STEP 1: The cashews and espresso beans go in the food processor together and will grind down until almost smooth. Here you can add coconut oil and this will help smooth things out faster. STEP 2: Add the cocoa powder and vanilla and continue processing until smooth. The longer you process, the smoother it will get. STEP 3: Allow the espresso cashew butter to cool and store in jars. I KNOW you guys. Like the easiest thing ever. And I love some of the nut butter brands out there too – they’ve got kickass flavors. But if you have a food processor or high-powered blender (i.e. Vitamix) then the possibilities are endless when you’re whipping up your own batches. You can use raw cashews or roasted – I always buy raw organic and then dry roast them myself. If you roast the cashews yourself, allow them to cool slightly before placing them in the food processor bowl. If using raw cashews, the process is going to take a little longer. You’ll also notice the espresso bean flecks will pretty much remain here. 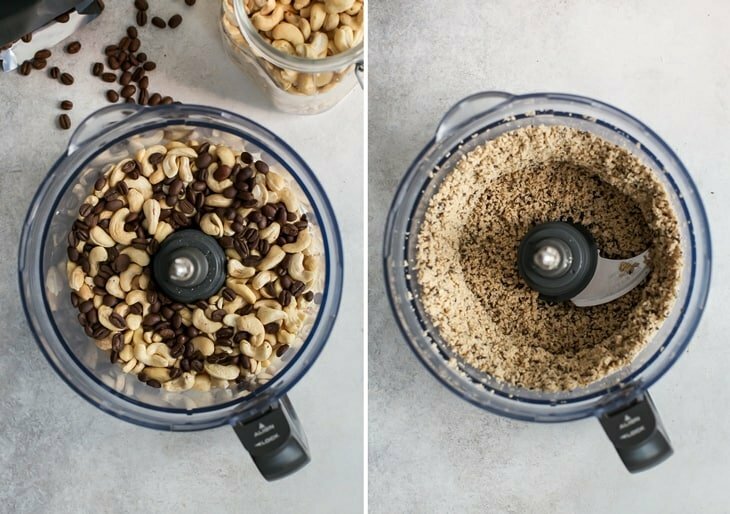 If you want less chunks, you can use a coffee bean grinder (or mini food processor/NutriBullet) to grind the beans separately, then add them in with the whole nuts for the first step. And you may be wondering why I decided to add the cocoa powder… You won’t really be able to taste any chocolate but it helps round out the flavors (or at least I think it helps). Also always vanilla – whether you’re fancy and adding a vanilla bean or just a splash of extract you can never go wrong with vanilla. The tulip weck jars make for great gift storage too! 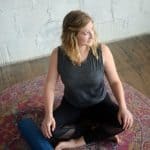 Leave a comment and review on the blog if you try this one. Always love hearing from you! 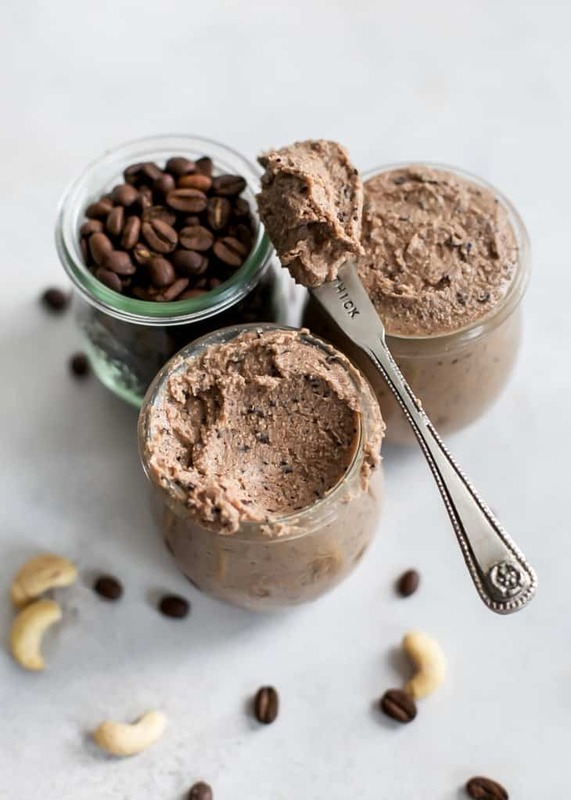 Homemade Espresso Cashew Butter made with just five ingredients and ready in 15 minutes from start to finish. You’ll want this homemade cashew butter on toast, in cookies, and straight by the spoonful. Vegan, gluten-free and Whole30 compliant. Preheat oven to 325ºF and place cashews on a large baking sheet. Spread evenly in one layer; toast for 8-10 minutes. Let nuts cool on pan for 10 minutes. Place slightly cooled cashews in bowl of food processor with espresso beans and cover with lid. Process until everything breaks down and cashews start to almost get smooth. You can add oil here to help speed things up. Scrape down the sides of the bowl when necessary. The time it takes will depend on the power of your food processor or blender and bowl capacity. 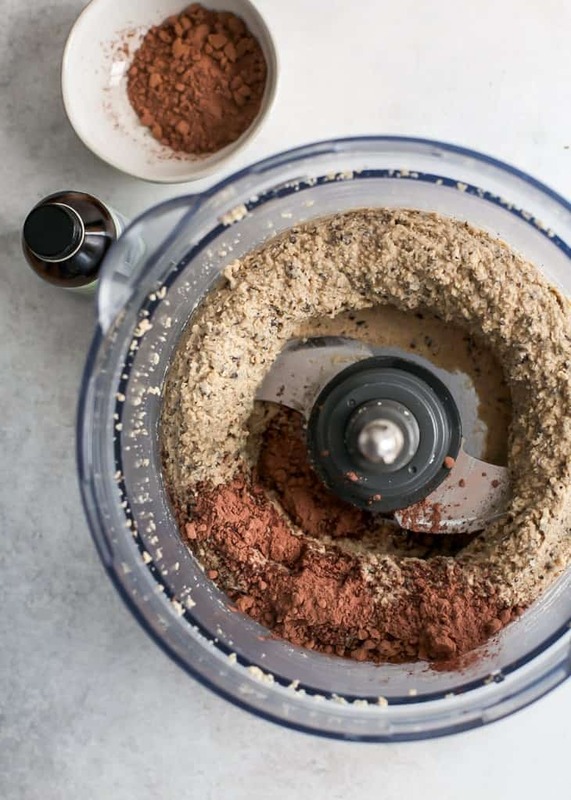 Once the cashew butter is almost creamy add cocoa powder and vanilla; continue processing until desired consistency is reached – the longer you process, the smoother and drippier the butter will be. The bowl will likely be warm so allow the cashew butter to cool slightly before putting in jar. Transfer Espresso Cashew Butter to 16oz jar with lid. Or divide into smaller jars. Store at room temperature, or fridge for longer period of time. Enjoy on toast, over oatmeal, in cookies, or quite possibly by the spoonful. 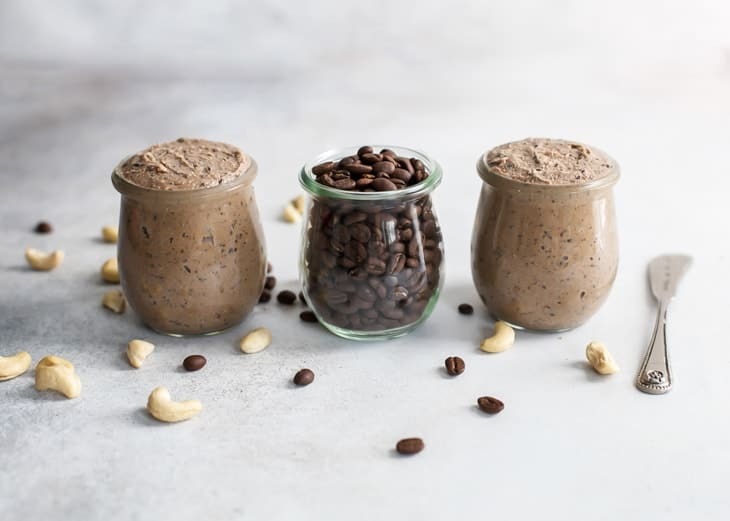 If you want less espresso bean crunch, process the espresso beans separately first in coffee grinder or small food processor before adding into food processor bowl with whole cashews. 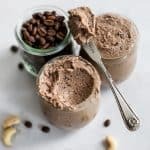 If you use instant coffee or instant espresso, the mixture will not have any crunch as the powder will dissolve one processed with the cashews. You can use oil to help smooth things out quicker or omit. This looks INSANE. 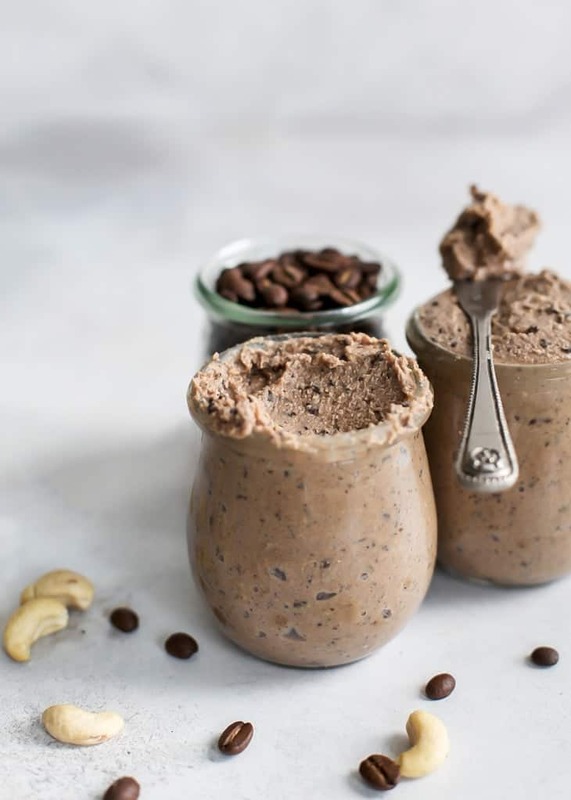 This recipe is for sure going to be next on my list when I make homemade nut butter next! (currently have two homemade nut butters in my fridge now…haha). Cashew butter is actually AMAZING. Not gonna lie. However, I never ever have succeeded at making homemade nut butter. I don’t know if it’s from my lack of patience, but I always end up with grainy and sandy nut butter! This looks yummy! What do you use this flavor on? Toast? I’ve never seen a coffee flavored nut butter. It would be perfect on waffles, instead of syrup. I’ve been wanting to start making my own nut butters. I’m definitely going to try this! Ashley where we live cashews are soooo expensive. Do you think this would work with peanuts? They are readily available. You can certainly use peanuts! I would roast them for the best flavor (or buy roasted, unsalted). 1. I have some instant coffee- do you think it will still taste good using that? 2. If I wanted to make as gifts for Christmas – how long do you think it last in a jar refrigerated? I am betting the instant coffee would taste fine, but you’d have to taste as you add to see how strong you want the flavor. It will blend and mix in with the nuts whereas espresso beans give the texture and crunch. I think if you stored these in the fridge they’d likely last a couple of months. Just made this recipe. It’s delicious! Taking it to a Christmas party to use with Neiman Marcus cookies. Amazing! Thank so much for sharing! What kind of espresso beans do you use? I have some regular coffee beans I use when I make French press coffee, would that work? Yes that works! French roast beans is fine. I used espresso roast beans but pretty much any will work. And I love the Breville! It’s awesome. Hope you get it!